In it’s ongoing homage to the backward patriarchal cultures of the Third World, the British government has long been busy shipping hoards of uneducated, poorly skilled Muslim immigrants into the culturally confused land of its forebears. And as we all know, with the importation of Muslim men comes their patriarchal Sharia cult of woman-hating polygamy. Never mind that such multiple pairings are illegal under British law, for the dictates of the multicultural mantra demand that such restrictions only apply to those ordinary European Anglo-Saxons who would end up in the slammer for daring to say I do to more than one female. But in our modern heyday of Third World victims and the veneration of their barbarically medieval mores by silly White progressives, not only has a very bleary British blind eye been turned to the multiple couplings of Muslim men, but the UK welfare system is actually supporting Muslim male polygamy with nice fat taxpayer-provided payments. Beginning in 2013, ‘extra’ wives will be able to claim a full single person’s welfare allowance despite being married, while the Muslim man and his first wife will receive the standard married couple’s allowance. In this way, the British government can pretend that it isn’t recognizing and financially supporting patriarchal polygamous relationships. The ‘extra’ wives are entitled to, not only welfare payments, but housing as well. And their children also receive financial support and multiple services all free of charge. Muslim men living in Britain can take numerous wives who live in other locations outside of the UK, father children with them, and then have the British welfare system support them all. Many Muslim men marry and then divorce their first wife, but then have a Sharia temporary marriage ceremony performed so that wife #1 can continue to live with the manly Muslim patriarch. In the eyes of British law, the man is divorced and is now free to bring another woman into the country and marry her, and of course, add the new bridal addition to the welfare rolls. The first ‘wife’ is now considered legally single and receives welfare benefits accordingly, as do all of her children. 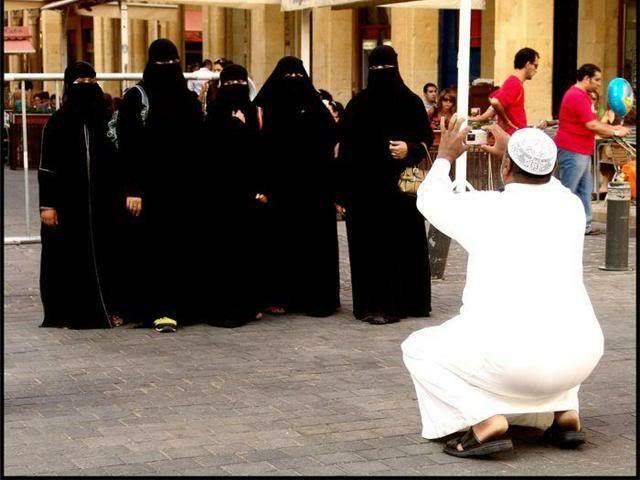 If a Muslim man has multiple wives before moving to Britain, then his polygamous relationships are considered legal. So a Muslim man with four wives can move to the UK and instantly receive £10,000 ($16,000) a year in financial support plus a housing allowance at a staggering £106,000 ($250,000) a year! The cost of such a welfare scheme has got to be astronomical. With UK businesses struggling and British workers finding it difficult to obtain any full-time employment, a sane voice has got to ask why the hell the government is importing unemployable, uneducated, foreign-speaking, and culturally backward indigents from the Third World who practice woman-hating polygamy. Do the progressive elites hate their history so much that they would defile their own nests with those who would pollute the very system that sustains them? Apparently so. The multicultural social justice filter applied to all things Third World is only yet another manifestation of the societal bacteria eating away at the foundations of a once great civilization. The multicultural malady plaguing Western countries today is a messy mix of self-serving condescension and a pretentious and phony hatred of all things European. Whether Indian Americans or Muslim jihad maniacs, the Left treats all these folks and the cultures they have created as they would any preschooler with its artistic attempt at drawing down reality—by proudly displaying their faltering daubs front-and-center on the kitchen fridge of our culture as if they were masterpieces to be hailed in the real world of the modern adult. The barbarians aren’t at the gates, they’re walking among us, compliments of White progressive elites. This entry was posted in Political/Social and tagged British Welfare System, multiculturalism, muslim, patriarchal, polygamy, progressives, sharia law, social justice, Third World, Uk. Bookmark the permalink. Just reading this gets me angry. I hate polygamy and I hate having to pay for it. The passivity of the British people is appalling. They look to the ruling party to run their lives. So true. They’re also terribly afraid to stand up to this because it doesn’t support the left’s drive for multicultralism. One day we’re going to have to fight these musloid savages. Buy a gun and keep your powder dry. It ain’t going to get any better. The sense of entitlement and the refusal to adapt to a culture in a new country that is making room for them and providing them with opportunities they could never get from the backward poverty pits they come from is astounding to me. We don’t owe them anything—they owe us. Couple this with the illegal immigrant issue and we (the U.S.) are in deep doo doo. Great article!